Project leaders Dhodapkar and Nooka designed the project to serve a major unmet need in multiple myeloma research. Investigators at Winship Cancer Institute of Emory University have received supplemental funding from the National Cancer Institute Cancer Center's Branch in multiple myeloma. The award, a supplement to the Winship Cancer Center Support Grant, will fund the development of resources and research to address racial and ethnic disparities in a disease that disproportionately affects African Americans. Multiple myeloma is a hematologic malignancy characterized by the growth of clonal plasma cells in bone marrow. Both multiple myeloma and its precursor stage, monoclonal gammopathy of undetermined significance (MGUS), are three times more prevalent in African Americans; however, existing biorepositories for specimens are based largely on European American populations. 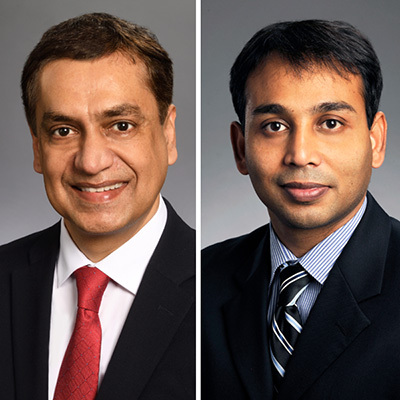 Project leaders are Winship members Madhav Dhodapkar, MBBS, director of the Winship Center for Cancer Immunology and a professor in the Department of Hematology and Medical Oncology, and Ajay Nooka, MD, MPH, associate professor in the Department of Hematology and Medical Oncology. Dhodapkar and Nooka designed the project to serve a major unmet need in multiple myeloma research. "Given that race-associated risk is already manifest early in the onset of plasma cell disorders, it's essential that we gain a more complete understanding of the biology of multiple myeloma precursor states in African-American patients," says Dhodapkar. "Knowledge gaps about racial disparities in multiple myeloma impact all aspects of care, disease biology, and prevention." Winship is home to one of the largest clinical multiple myeloma programs in the nation and has a large, diverse catchment area. Georgia ranks third among all states in its total population of Black or African-American residents. Percent enrollment of patients onto Winship clinical trials closely mirrors the demographics of the state. The team will develop a comprehensive biorepository of specimens from African-American patients and use state-of-the-art laboratory-based techniques to characterize the biology of the specimens. The research will help identify new prevention approaches that target precursor states and clarify the impact of lifestyle changes on the tumor microenvironment. "We are exceptionally grateful to the National Cancer Institute Office of Cancer Centers for supporting the development of this resource, which we anticipate will advance the urgent need to understand, treat, and prevent the onset of multiple myeloma," says Nooka. The work is supported by the National Cancer Institute of the National Institutes of Health under award number P30CA138292.